An old man returns to his hometown and, dismayed at late 20th-century decadence, proceeds to punish some of the more egregious exemplars. He has the psychic ability to materialize his late beloved wife, the divine Judy, who appears in this author's other novels as well. Life, love, and the whole list. There were hills behind him (smoke coming off the summits) and fields of a yellowness that made him moan out loud—so felt the first man seeing that he was alone upon the world. He could foretell all: billions upon billions of years in a place with seasons, and hills that were sometimes here and sometimes there, and billions more still until Time had had enough. He liked to walk for perhaps an hour, with long stops between. And then to come upon a high place, a view of the rueful beauty of earth and all that had taken place upon it. It was good: a plot turning back to weed, a ruined barn with vertebrae sticking out. Watching closely, he began to piece together in imagination the love affair, notorious in its day, that had perhaps worked itself out where he was standing, and perhaps was working itself out still. He pushed on. Lately he had taken to using a stick which, with his satchel and tattered clothes, had a way of making dogs to burst into song. His ankles had worn down to a thinness. Moreover he looked excessively sly. He knew what he knew and it was this that kept him away from cities. Not that there were any great settlements along his route! On the contrary, he had been traveling all day and seen nothing but ruined fields and barns. Now in truth he began to have that feeling the first man felt, namely that it was his part to keep moving, that he was alone, that very probably the world with all its smoke and mountains extended on in perpetuity forever. … He stood at once, took off his coat and walked away from it. The money was of no use and yet he found himself against his own best will and determination coming back for it after all. Another ingenious idea came to mind—to take off his shirts as well. He had wanted his death by heat, being too old to experience cold in its full meaning. Too old, too thin, his head too occupied with books. He was amused at his self-spectacle, all the more so that he had taken recently to using suspenders. He was quite cheerful. He made a mental note: "There was no fear." Sometimes he went forward, sometimes he slept. One time he heard his dog yapping to come out and play. These phenomena were strange—never would he have expected vomiting from the result of cold. He had come far. What he thought to be a hamlet, in fact they were the distant spires and steeples of the egregious Birmingham itself. Yet he could not honestly say that he was not dreaming. His one great dread—that the sun with its famous warmth might come and bring him back to earth again. Lee by Tito Perdue is a spellbinding work which gives an entirely new slant to our view of what we have come to call reality. This slim novel has all the makings of a classic in the manner in which it depicts the ongoing evolution of one life. Perdue has touched at a very American nerve—a very Southern nerve which sends our lives and his imagination on a collision course to revelation. 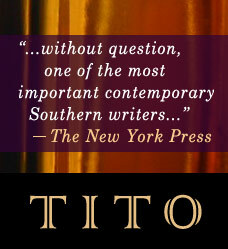 In this, his first novel, Tito Perdue has managed to pull off the unthinkable—to take a character's rage and hatred and turn them into qualities that are, if not exactly worth our admiration, certainly due our respect. His protagonist, Lee, is an old man who, as the book begins, returns to the Alabama hometown he left half a century before under shadowy circumstances of disgrace. Lee gives new meaning to the word curmudgeon—in short, he hates everything, not least of all the stultifying modern society that, he feels, has stolen our very souls. Rather than lament it, however, Lee enacts a plan, cudgeling particularly offensive individuals with a thick walking stick, entreating them to save themselves by uttering "one intelligent word." Written in a hallucinogenic, fragmentary style that bears comparison to Beckett and Faulkner, Lee is a stunning debut, an insistent eulogy for the intellect in these slack-eyed days of ignorance and bliss. With his harsh, vitriolic humor, Leland Pefley maps out a world without redemption, without hope, and one in which the only means of correcting the problem involves "an advanced torture machine with the whole world attached." Midway through Lee, Pefley finds himself in a difficult dilemma: "having to choose which of the world's writings to salvage and which to let lapse." ... 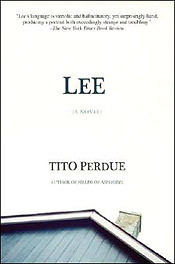 Yet if conscious of his place in literature, certainly Lee would choose those of his creator, Tito Perdue, to live on. A first novel that follows an old man, a kind of Old Testament prophet full of books and anger at the age, as he wanders—sometimes violently—through the modern urban world and into his own past. Perdue writes convincingly and iconoclastically about a misanthrope who is frightening in his complete contempt for anyone who has not "held on to their soul." Written with uncompromising venom, Perdue's stunning novel tells us more about ourselves than we might want to know. 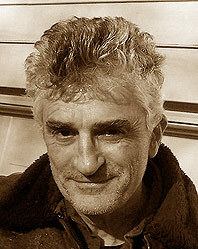 The author's obvious talent and uncanny wit are reminiscent of Samuel Beckett. …Its language is vitriolic and hallucinatory, yet surprisingly lucid, producing a portrait both exceedingly strange and troubling.